Note the exoticism that Berhardt radiates here with her dark flowing hair and tan skin and flowing wrap. Some time ago, I came across a lovely photo of Sarah Berhardt on Pinterest. I have always been fascinated by Berhardt so I decided it was time to do a post devoted to her. 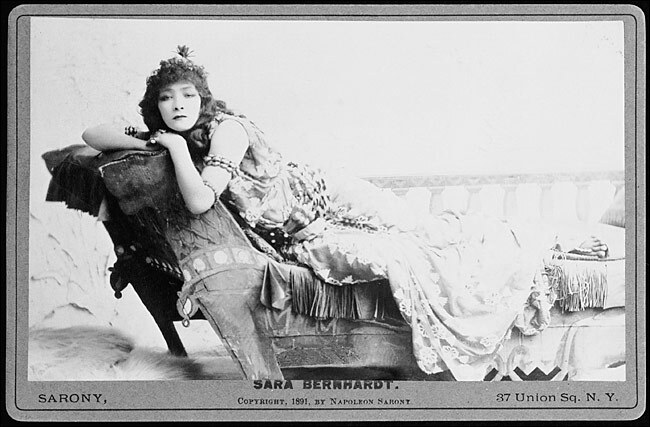 For all intents and purposes, Berhardt was one of the first, if not the first, international celebrity actress. She earned the name “The Divine Sarah” by fans worldwide for her stunning dramatic performances and enjoyed a long and prosperous career. But Berhardt, like most successful artists, had troubled beginnings. Her mother already came from questionable background (her own father was rumored to be a petty criminal) and she was not above doing what she had to do to support her daughters, including becoming a courtesan. Like many strong women, Berhardt grew up in the company of women (her mother and two sisters) without a father. She learned early in life that dramatic flair and beauty could turn a woman into a success in the 19th century. Berhardt was sent to a convent (ironic, considering she was born Jewish) and contemplated becoming a nun, but decided eventually to attend the Conservatoire de Musique et Déclamation in Paris to study acting. Her dark and exotic beauty played into the Victorian fascination with Orientalism. She moved on to the Comédie Française where she made her debut in 1862 in the Greek tragedy Iphigenie by the French writer Racine. However, she was fired from the theater for getting into a tussle with an older actress and escaped to Brussels. She found success there, however, and played lead roles in tragedies such as Shakespeare’s King Lear and the Victor Hugo tragedy Ruy Blas. Throughout her career, Berhardt pushed the envelope with her performances, taking on roles not only of strong women but also of male figures. She caused quite a scandal when she played the title role of Shakespeare’s Hamlet in London in the 1890’s and in the one-act play by Francois Coppee called Le Passant. Berhardt’s talents expanded to producing and directing when she bought the Theatre de la Renaissance and, later, the Theatre des Nations in the 1890’s. Her talents extended beyond the theater as well, as she was a sculptress and one of the earliest actresses in film, playing mostly in short films about her life. She even dabbled in art, creating interesting sculptures and paintings, of which about fifty survive today. 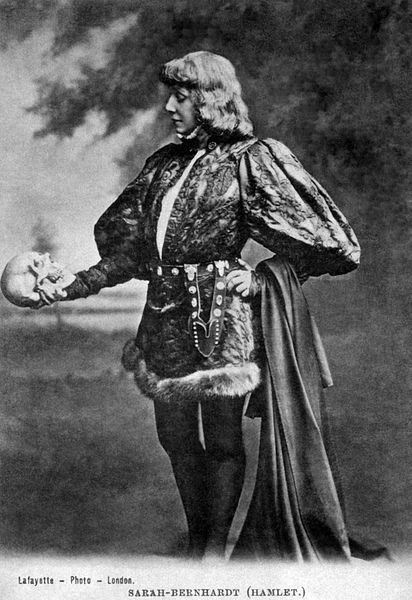 A nice example of Berhardt’s flair for the dramatic in costume and pose. Berhardt’s acting abilities leaned towards the melodramatic, a popular style in the Victorian era. She went big with broad sweeping gestures and expressions and, as her photographs show, costume and posing were high on her list. This is maybe what made her larger than life for many people, especially in the age before film. Her international success is astounding since, unlike film, a theater actress could not be known in the United States or London or anywhere else unless she had actually physically performed there. Her propensity for drama served her well in her real life as well as her professional life. It was rumored that, after a fire had destroyed her birth records, she took liberties with creating her own past, one that was much more respectful than her real past. 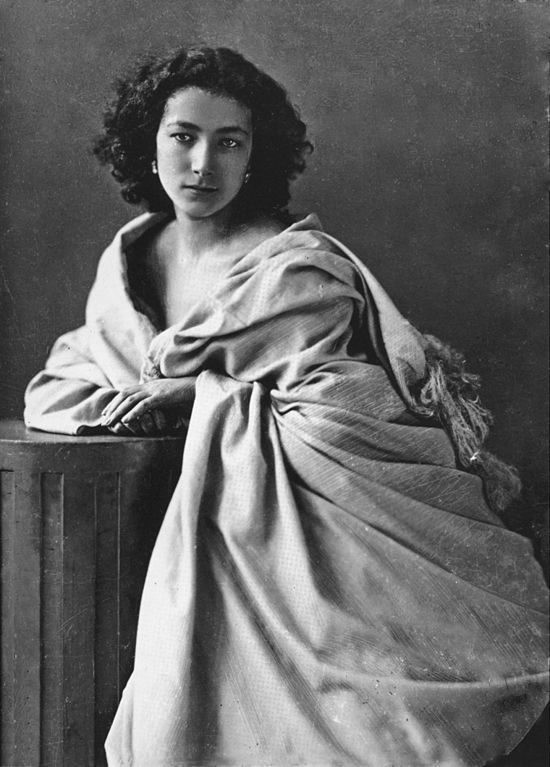 In addition, when she seriously injured her knee in a 1905 revival of Tosca, gangrene set in to the point where she had to have the leg amputated and she preferred not to wear a prosthetic limb. Sarah Berhardt was, like many artists, diverse with her talents and complex in her style. Her international success in addition to the popularity her acting reputation enjoys today indeed earns her a position as someone memorable and divine.